As a multidisciplinary not-for-profit research institute, CBSET supports a range of applications in therapeutic and device development, with AAALAC-accredited animal research facilities and GLP-compliant analyses. Histology is a critical endpoint for the non-clinical evaluation of medical devices, drugs, biologics and biomaterials. 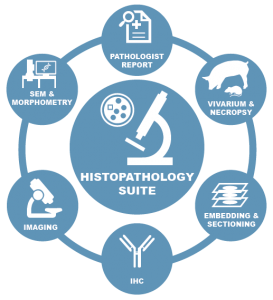 Our histopathology suite and ACVP boarded pathologists provide flexible support and active collaboration for all facets of sample processing, staining, imaging and analysis, pairing it with expert interpretation and reporting. We will devise the right histopathology protocol for your aims and apply the optimal staining paradigm to satisfy your scientific endpoints. 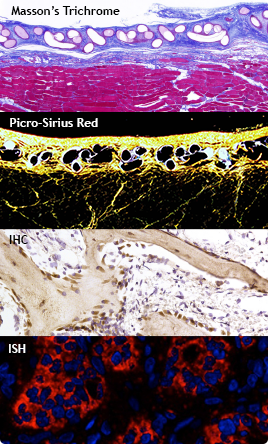 Secondary staining (IHC, IFA, ISH) is used for pinpoint contrast and quantitative analysis. Immunohistochemistry (IHC) and Immunofluorescence (IFA) use antibodies targeting cellular biomarkers, coupled to chromogenic enzymes or fluorophores, for improved dynamic range and sensitivity. In Situ Hybridization (ISH) detects expression of RNA in sections via oligonucleotide hybridization to target RNA sequences. CBSET can support your next study with industry-experienced, board-certified veterinary pathologists co-located with an integrated scientific team, to inform your regulatory and scientific endpoints with confidence.